Check out our best items for the Summer! 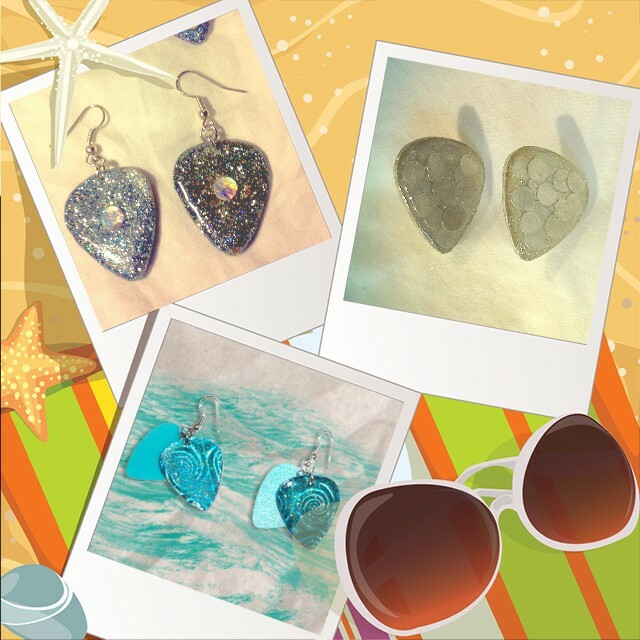 Psychedelic Waves Guitar Pick Earrings - Shiny eye catching holographic 3D swirls and waves blue guitar pick charms great for being out in the sun! Reflective Earrings & Bracelet - Earrings feature Neon reflective guitar pick earrings made with Orange and Yellow reflective material. Bracelet features Reflective Guitar Pick Pendant (Glittery backside) with Green and Orange rubber bracelet. Custom Colors Earrings - GET A CUSTOM PAIR OF GUITAR PICK EARRINGS!Two colorful guitar picks for each side! Pick your colors! You can also just have one kind of pick, just choose one color. Patterns are also available: Zig Zag and Harlequin. Rainbow Fish Scales Earrings - Stud guitar pick earrings feature a "Rainbow Fish" design--of course inspired by the book The Rainbow Fish. I made silver picks with layered shiny material to emulate scales. Shiny Earrings - Blue, purple and green painted picks with different hues of glitter. Earrings are packed with glitter and shine! Light Catching Earrings - These earrings are made from sun catcher beads used for making stained glass.